Stelter, G.a. and Alan F.j. Artibise. "Urbanization". The Canadian Encyclopedia, 04 March 2016, Historica Canada. https://www.thecanadianencyclopedia.ca/en/article/urbanization. Accessed 22 April 2019. 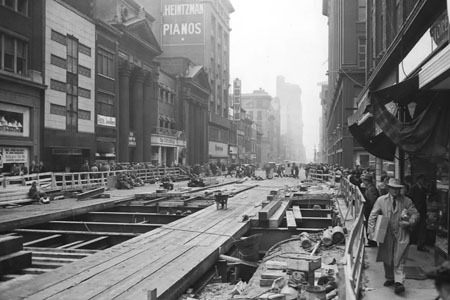 Yonge Street subway construction, circa 1950s (courtesy City of Toronto Archives/Fonds 1128, Series 381, File 15, Item 6207-2). Urbanization is a complex process in which a country's population centres tend to become larger, more specialized and more interdependent over time. It arises from interacting economic, social, technological, demographic, political and environmental changes. Over 80 per cent of Canadians live in urban centres. The three largest cities are Toronto, Vancouver and Montréal. In 2011, 81 per cent of Canadians lived in an urban centre, compared to 45 per cent in 1911. Statistics Canada defines an urban area as community with 1,000 residents or more. According to the 2014 United Nations report on global urbanization, Canada ranks 40th in the world. It is more urbanized than the United States, Norway, France and Germany, but less so than countries such as Japan, Belgium, Australia, Israel, the United Kingdom and Argentina. An important characteristic of Canadian urbanization is distinct regional variations reflecting the different economic bases of provinces and territories. Ontario, Québec and British Columbia have long maintained proportions of urban population at or higher than the national average. More recently, they have been joined by Alberta. On the other side of the coin, some long-established centres have been losing population for substantial periods. This trend has accelerated recently as immigration has become the determining factor in comparative population growth. The 2011 Census revealed that about 34 per cent of municipalities with 1,000 inhabitants or more (321 out of 951) have declining or static populations. These were located disproportionately in Eastern Canada and among centres of 5,000 or fewer inhabitants. Population decline promises to become more of an urbanization issue in the future. Vital choices need to be made about investment in health care facilities, infrastructure and amenities to serve an aging population. Six major urban agglomerations concentrated around Toronto, Montréal, Vancouver, Ottawa-Gatineau, Calgary and Edmonton receive the bulk of immigrants and investment. They also contain most of the faster-growing municipalities. Because of the initial role played by the royal courts of France and England, Canada became an urban nation relatively early in its history. The urbanization process has passed through five major phases and, in the 2000s, entered a sixth stage. These phases overlap: each one has not entirely taken the place of previously established patterns. The earliest European urbandevelopment was characterized by imperial (French and British) control over location, function and growth. Québec City, Montréal, Halifax and St John's tended to be administrative or military centres. Economically, they were collection points for colonial resources and distribution centres for manufactured goods from the mother country. There were few significant connections with other towns in the colonial Canada: their primary relationship was with Paris or London. A second phase began in the early 1800s, marked by increasing control by locally based commercial interests over development. Exclusive reliance on resource exports such as lumber and fur was reduced, giving way to a new emphasis on artisanal production for local or regional markets. Some cities began to assume metropolitan functions, dominating their immediate region. New transportation technologies came into use, notably steam-powered shipping, railways and production equipment in factories and workshops. Banking, postal, stage coach and other connections among settlements increased. The form of cities also changed as imperial direction became less important. Land surveys and related town plans promoted more orderly development. Transportation routes and the provision of water and sewer services began to determine the long-term direction of development. Functions of cities began to be sorted into residential, commercial and industrial categories, and also along class and ethnic lines. The third phase began in the late 1870s, with industrial expansion prompted by Prime Minister John A. Macdonald’s National Policy and settlement of the West. This lasted until the late 1920s and saw the development of a Canada-wide urban system linked by rail, telegraph, canal, post office and telephone systems. New Western cities began to arise. However, economic power was concentrated in central Canadian cities, notably Montréal and Toronto. More fully developed industrial capitalism and its counterpart, the industrial working class, emerged. National politics began to be shaped by conflicts between these two groups, as demonstrated by the Winnipeg General Strike of 1919. Urban development depended more than ever on major improvements in technological capacities. Science and engineering were systematically applied to transportation, telecommunications, building methods and production. Rapid expansion of suburbs along streetcar lines was combined with tall office towers in the central core. All aspects of urbanization became larger: size of suburbs; heights of downtown buildings; and organization of business enterprises accompanied by enormous factories. Land use was increasingly specialized. Zoning systems were adapted from those applied in the United States and Great Britain, beginning most actively in the late 1920s. A fourth era of development began during the Second World War with industrial mobilization for defence production during the 1940s. This extended into the 1970s. The new “corporate” urban era was characterized by expanded use of automobiles and trucks, displacing streetcar and railway transportation respectively. Urban economies shifted from a base dominated by manufacturing to one increasingly reliant on providing services. Decentralization of both population and economic activities began in earnest. Canada's population grew rapidly owing to a flood of immigrants and a domestic “baby boom” after the war. Comprehensively planned suburbs were developed by the private sector; modestly appointed high-rise apartments were built in the core and along transit lines; suburban industrial parks were established; even higher downtown office towers became the norm; and regional shopping centres supported and encouraged suburban expansion. By the late 1970s, a fifth era in urbanization was identifiable. Populations of the old urban core areas levelled off or even declined. Suburbs and areas around the periphery of cities expanded considerably. Long-established cities, previously attractive to rural migrants, began losing population to “ex-urban” areas. In contrast to the United States, however, the Canadian shift to the suburbs was not as much motivated by ethnic or racial factors. Medium-sized cities and their suburbs grew as well as larger urban centres. Changes to national policies on unemployment insurance helped population centres in previously declining areas of the country to carry on. Nevertheless, the proportion of employment in farming continued to decline. Also in the 1980s, larger municipalities annexed adjoining lands and municipalities to increase their tax base. For example, Edmonton's land area was effectively doubled through annexation, a process which added approximately 100,000 new residents to the city's population by 1986. After the 1980s, a sixth era began to take shape. The percentage of Canada’s population living in urban areas stabilized at around 80 per cent. The population as a whole aged. Natural increase slowed effectively to zero net growth. High immigration levels to Toronto and Vancouver in particular fuelled these cities' expansion, increasing their cultural and ethnic diversity. Retirement and leisure communities began to boom across the country. Larger metropolitan communities continued to grow. Populations of many smaller urban places declined, except in metropolitan commuter-sheds and attractive leisure areas. Decentralization continues as outer suburbs attract new industry and grow more rapidly than central areas. At the same time, however, new downtowns are being developed or expanded in larger urbanized regions. Examples of this trend include: Burnaby in Metro Vancouver; Mississauga town centre and Markham town centre in Greater Toronto; and Laval in Metropolitan Montréal. These trends all contribute to multi-centred urban regions becoming the norm. There continue to be very densely populated cores, dominated by some of the tallest structures in the world. These are inhabited by large numbers of financial and other service workers in cities globally connected via the Internet and cellphone systems. Canada’s cities have always had international links, initially focused on Europe. Many are now connected not only with their rural neighbours, but also with urban counterparts around the world. For example: the London and Shanghai financial markets; Hollywood and Mumbai entertainment complexes; Russian and Kazakh oil businesses; Latin American and Australian mining ventures. Canada’s urbanization has demonstrated both successes and ongoing challenges. Chief among to manage expansion and promote sustainable development. For example, to accommodate growth, cities must invest in infrastructure while at the same time preserving green space and preventing air, water and land pollution. A solution is to concentrate development near existing neighbourhoods, which increases density and limits sprawl. However, land prices rise as a result, making property ownership difficult for many middle- to lower-income individuals and families. Urbanization also poses a challenge for rural areas as their population and economic opportunities decrease. R. Florida, Who’s Your City? How the Creative Economy is making Where You Live the Most Important Decision of Your Life (2009). C. Kennedy, The Evolution of Great World Cities: Urban Wealth and Economic Growth (2011). M. Polèse, The Wealth and Poverty of Regions: Why Cities Matter (2009). J. Simmons and L. Bourne, “The Canadian Urban System in 2011: Looking Back and Projecting Forward,” Research Paper 228, University of Toronto (2013). Institute of Urban StudiesThe website of the Institute of Urban Studies from the University of Winnipeg. Features a database of urban studies reference sources. Imagining Toronto The website for "Imagining Toronto," an award-winning book and related York University course taught by Amy Lavender Harris. Check out the online lecture notes and the wide-ranging bibliography of works related to past and present Toronto. Also see the latest news about Harris' public talks on Toronto literature and the imaginative qualities of cities.